Australian activist Avi Yemini exposed some of the selective editing that has made the far-left, which is an ever-increasing portion of the left in general, the experts on how to create “fake news.” However, when they get called out for their deceptive lifestyle choices they seemingly really don’t like it. 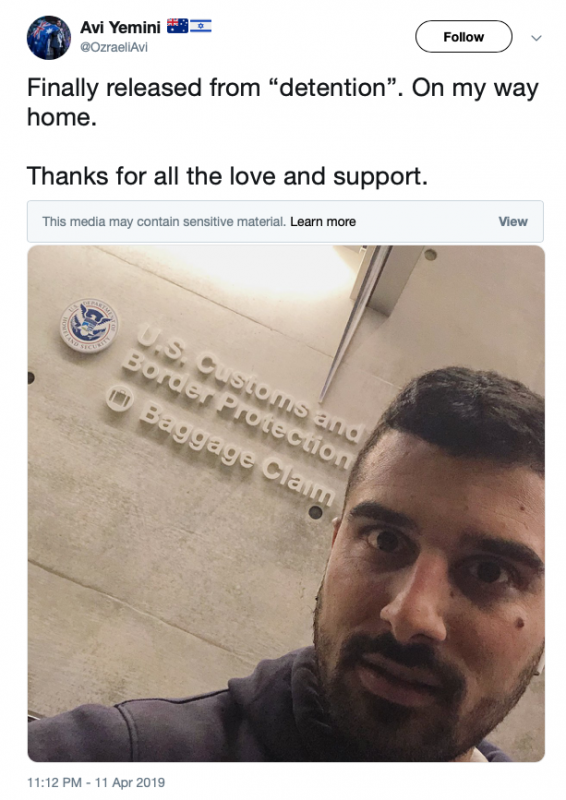 Yemini claimed on Twitter that he was “DETAINED and INTERROGATED” by authorities upon his arrival at an airport in Los Angeles. 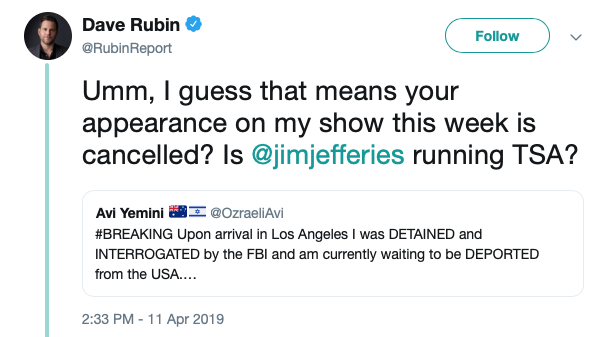 The political commentator has alleged that it was “@ComedyCentral” who was the “informant” that notified authorities of his questionable presence in the U.S.
Yemini was traveling to the U.S. in order to appear on interviewer Dave Rubin’s program, along with an appearance on Steven Crowder’s podcast. 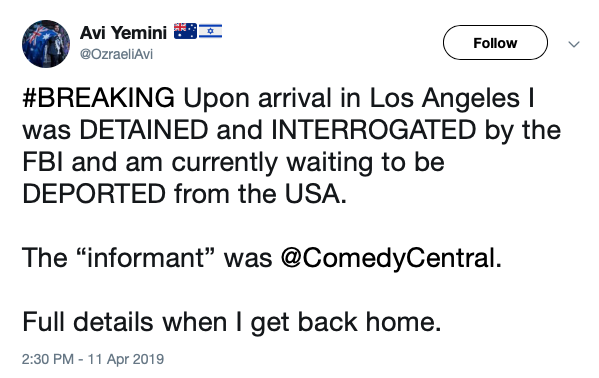 If there is something to Yemini’s claim that Comedy Central, who is owned by Viacom, informed authorities that Yemini posed a threat to the U.S., why would they do such a thing? In March, Yemini exposed the hyper-critical-of-America host of “The Jim Jefferies Show,” Jim Jeffries. Don’t let the fact that Jefferies benefits from being in America distract you. He is a liar, at least when it came to the selectively edited interview with Yemini. Yemini agreed to do Jefferies show on the conditions that he not be affiliated with any alt-Right, white supremacist or Nazi groups and that the interview not be edited to misrepresent his beliefs through distorting his answers. Jefferies and his team ended up doing both to Yemini. What Jefferies and his producers didn’t know was that Yemini was recording the whole interview, unbeknownst to them, on his cell phone. As you could see above, Yemini was misrepresented on an epic level. As a result, Jefferies has received a major backlash in the weeks following the reveal of his team’s selective editing of the Yemini interview. Jefferies and his crew attempted to make Yemini look like an Islamophobe, when in reality it was Jefferies who was the only one that could’ve been construed as such in the video.